A tryptophan coma just waiting to happen. We’re eating grilled butterflied turkey that was brined in a mixture flavored with chipotle in adobo puree, epazote, cumin, chile powder, garlic and mexican oregano to ensure flavorful juicy meat. So what if I’m not posting my turkey recipe until after Thanksgiving! Get off my back, yo! You can always use this recipe for Christmas… or Turkey Day next year or in the middle of summer during grilling season! Apparently a technique that I’ve always known as “butterflying” is trendy under a different name – Spatchcock. Spatchcocking and butterflying a turkey (or any fowl) are really the same: you simply cut out the back bone of the bird then crack the breast bone so the bird can lay completely flat (essential for even cooking!). Here’s a video for those of you (like me) that are visual learners. Watch and learn. This technique is a great time saver and cuts the cooking process in half. If you know me, you know I can be one lazy ho, so the less time I have to spend tending to the bird the better. After butterflying our bird, I submerged it into a Mexican chipotle spiced brine to sit overnight to give it some flavor. The day of our feast I just patted it dry, seasoned the skin, then seared both sides over high heat on the grill before putting it into its final resting place: an aluminum roasting pan on the grill over indirect heat. All in all, I think the cooking process took me about 2 hours and produced fantastically moist and smokey turkey. Next time you have a reason for a feast, why not try spatchcocking your bird and throwing it on the grill? Completely submerge the butterflied turkey into the room temperature brine. Put a lid on the pot or cover with plastic wrap then place entire pot into the refrigerator. Allow the turkey to sit in the brine, refrigerated, for 12-18 hours. Allow the turkey to roast on the grill over indirect heat until an internal temperature of about 168 has been reached, basting with melted butter and rotating the aluminum pan 180 degrees every 20 minutes. 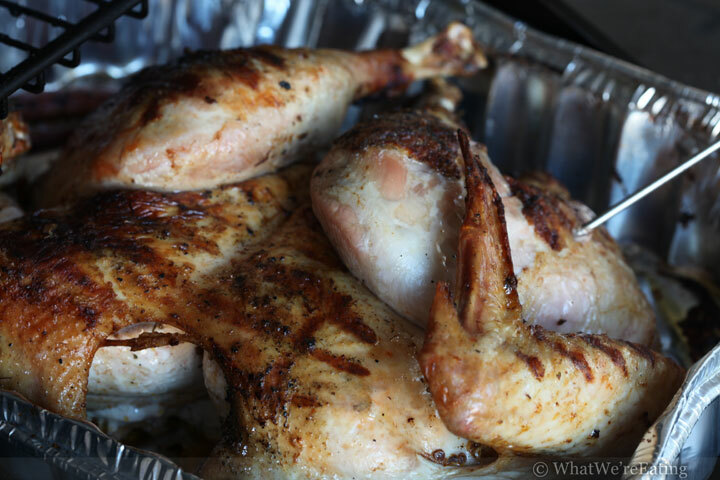 Cooking times will vary depending on the size of the bird so USE A THERMOMETER ! Once the desired internal temperature has been reached, remove the pan with the bird from the grill. Loosely cover the turkey with aluminum foil and allow it to rest for 15-20 minutes so that the juices can be redistributed throughout the meat. To slice first remove the drumstick and thigh in order to better access the breast meat. Slice as desired. Enjoy! Do you know if you can brine with Splenda, or is there something about the chemical reaction of the sugar? Always wondered that. you know, kalyn, i have no clue! i haven’t really consumed much splenda let alone cooked with it. can you eat agave syrup on the south beach diet? i’m sure you could sub agave syrup for the butter if so…. or just leave out the sweetener all together. brine doesn’t really need sweetener. Great Recipe! I doubled the recipe – minus half the water for an 18 pound bird. Perfect to add some spice to the Christmas Feast…thanks! I stocked up on turkeys when they were cheap and I can’t wait to try this for a Sunday company dinner- sounds amazing! !